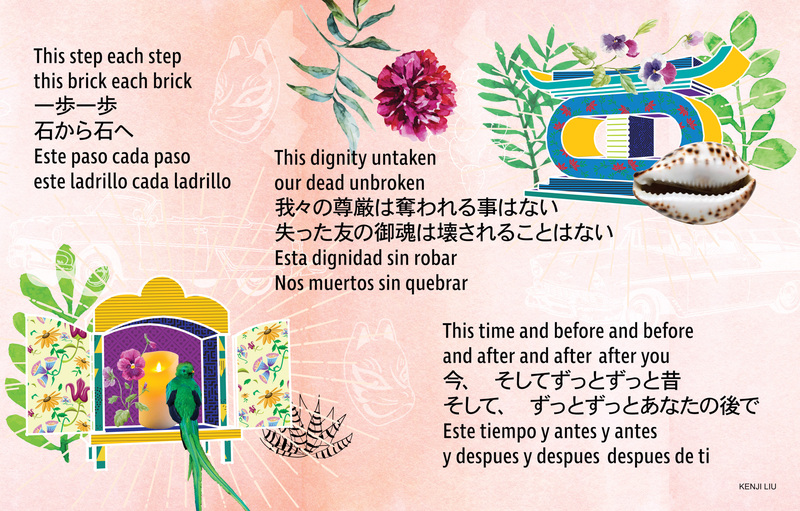 This Place is an Altar is a digital collage representing four communities with historic roots in the multi-ethnic, greater Little Tokyo area: Japanese American, African American, Mexican American, and Tongva. Each has lived on this land and are connected through complex histories of oppression, settlement, solidarity, and displacement. The vision of this project is to portray these communities as interconnected and to promote solidarity in the face of the variety of continued erasures each faces. 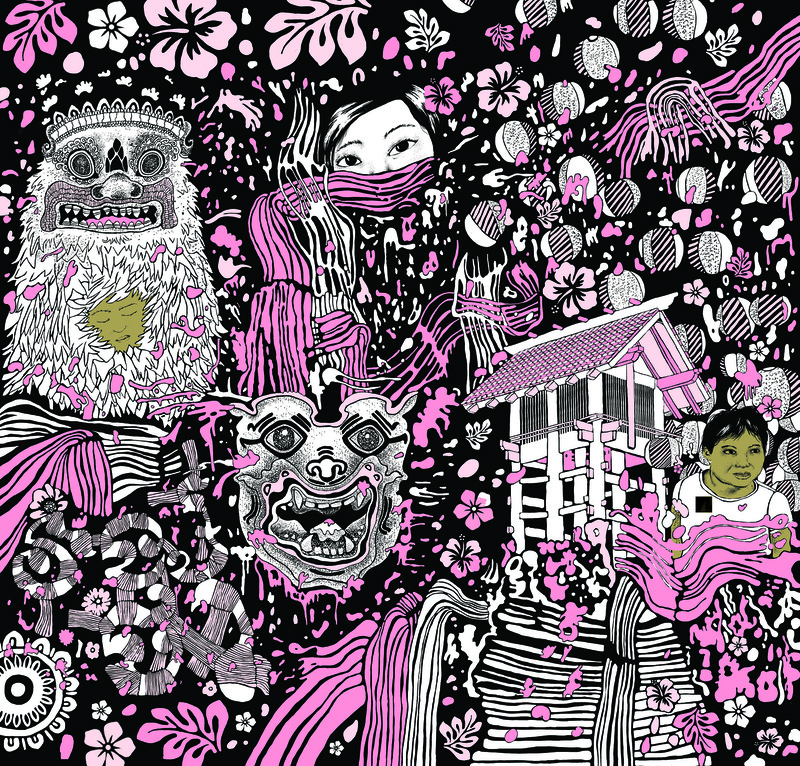 This artwork features cultural symbols and offerings, and is inspired by hokora and yorishiro, which enshrines kami or spirit in a physical object. Each symbol in this artwork “calls in” the helpful spirits and ancestors of each community, anchors them, and offers them repast. 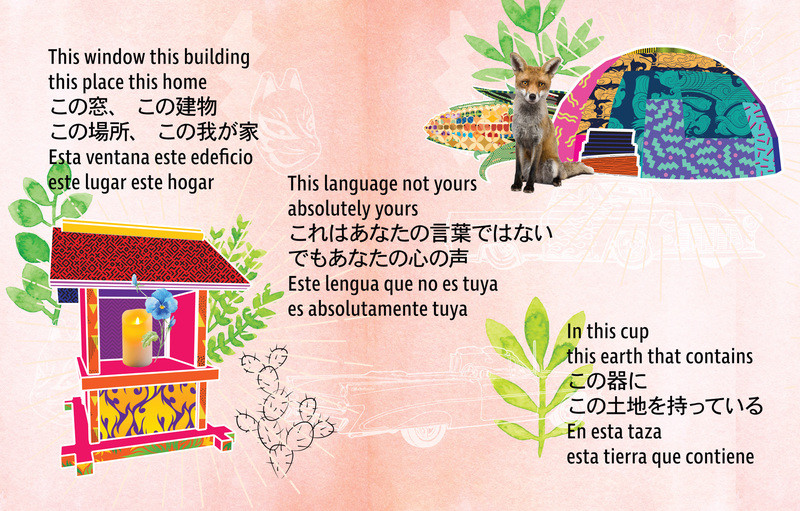 Also integrated into the artwork is a poem and translations into Japanese and Spanish, written while spending time in Little Tokyo. The Nebuta float tradition evolved from the ancient Buddhist custom of floating lanters down a river to carry away ancestral spirits. The Nebuta Festival in Aomori Prefecture is one of the oldest and most well-known summer festivals in Japan. 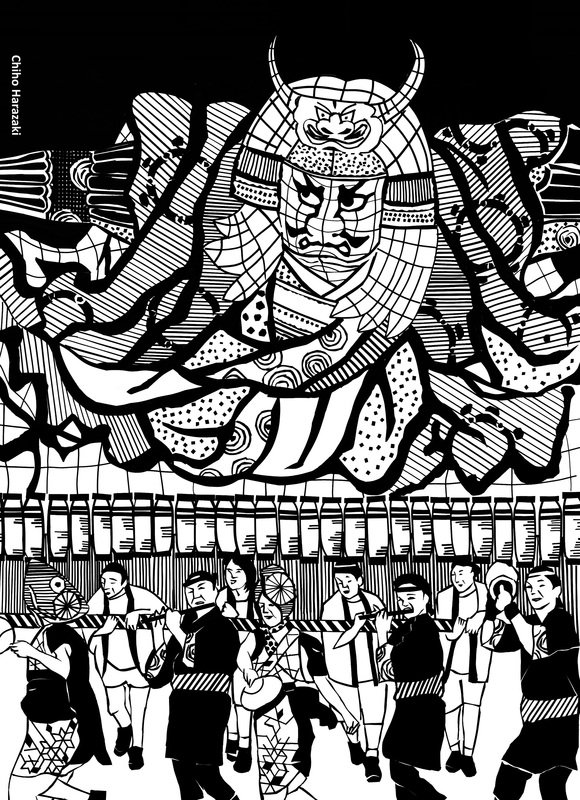 The subject of this piece, an enormous Nebuta float bearing the fierce likeness of samurai Shingen Takeda, first appeared in the Nisei Week Festival in Little Tokyo in 2007. Designed by master Nebuta artist Hiroo Takenami and constructed of wire and paper, the float was painted in vivid colors and illuminated by over 600 lights. More than 200 dancers called haneto, together with trained taiko drummers and Japanese flute players called ohayashi, accompanied the float. The create this piece, tiny pieces of black tape were cut using a precision knife and scissors. The hand-cut shapes and lines are reminiscent of traditional Japanese arts like woodcut and papercutting. Nancy Uyemura's artwork will be installed beginning July 21, 2018 at JACCC. Please join is for the opening at our Windows of Little Tokyo Halfway Reception on Saturday, July 21 at Far East Lounge, 353 E 1st St.
Little Tokyo Stance, located at the Brunswig Square storefront, is a figurative homage to generations of Japanese Americans who have loved and labored on behalf of their historic community: the first generation Issei pioneers who came to Los Angeles and established livelihoods, raising families and building local economies; the artists who reclaim folk traditions as a vital act of resistance to the erasure of cultural difference; and the Asian American activists, for whom community organizing is a form of stewardship of past generations’ labor and sacrifice. Framing the figure grouping are two trees that continue to stand and bear witness to more than a century of history: the Aoyama Tree at the former site of Koyasan Daishi Mission and the Wolfskill Orchard grapefruit tree that continues to bear fruit. 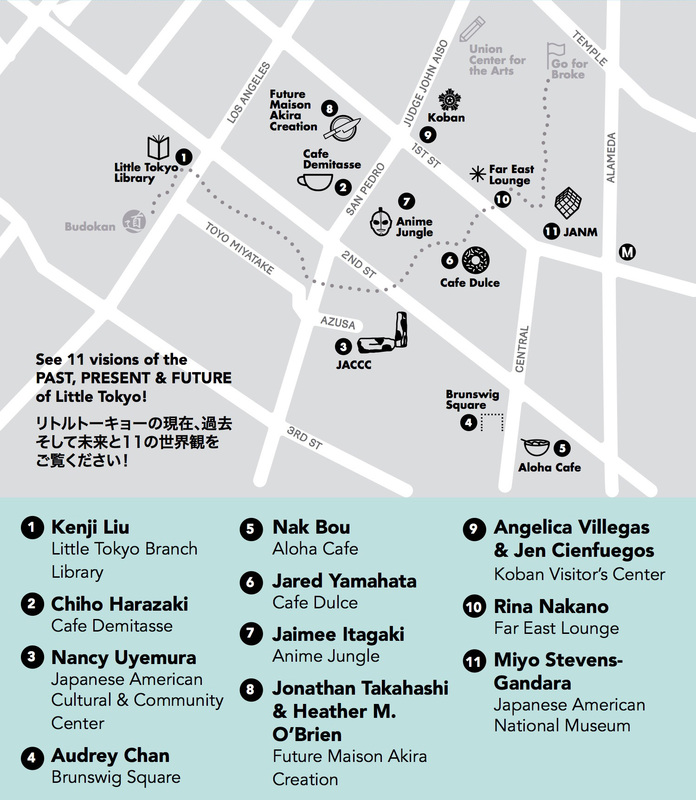 Passersby are invited to consider what taking a stance means at this moment in Little Tokyo’s history. 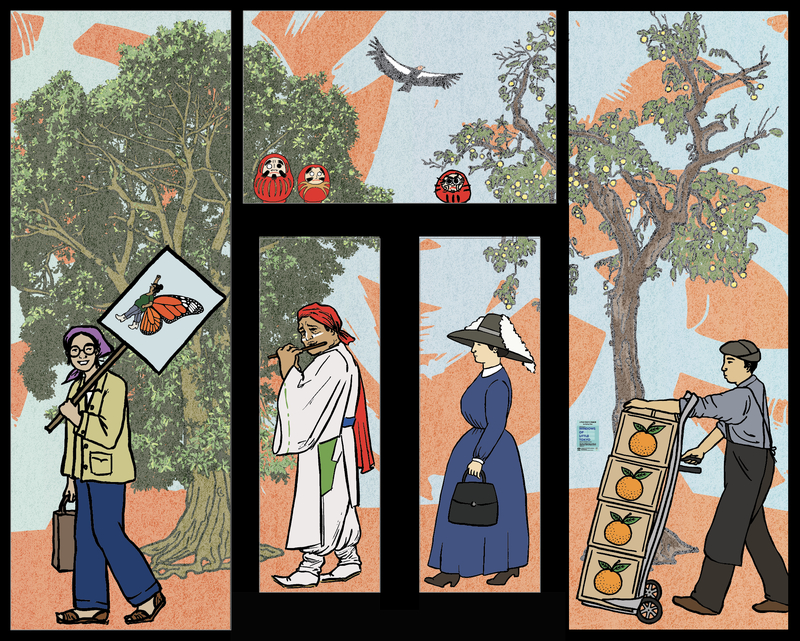 The illustration is a visual conversation rooted in the spirit of Little Tokyo’s multicultural communities and their histories. My effort was to capture the various cultures and influences that are embedded in the fabric of this historic district. As a Cambodian American, I grew up influenced by major Western art movements but had always found Japanese art exceptional. The illustration is an effort to cement Little Tokyo as a place that embraces diversity and is open to ideas that shape and influence the culture of Greater Los Angeles. The contrasting shapes, colors, and figures in the piece actualize something that didn’t exist before. With this illustration, I tried to capture Little Tokyo’s 134-year-old existence by embracing elements from Japanese American history and multi-ethnic communities, along with symbolic gestures of the future represented by floating ribbons of color and lanterns. 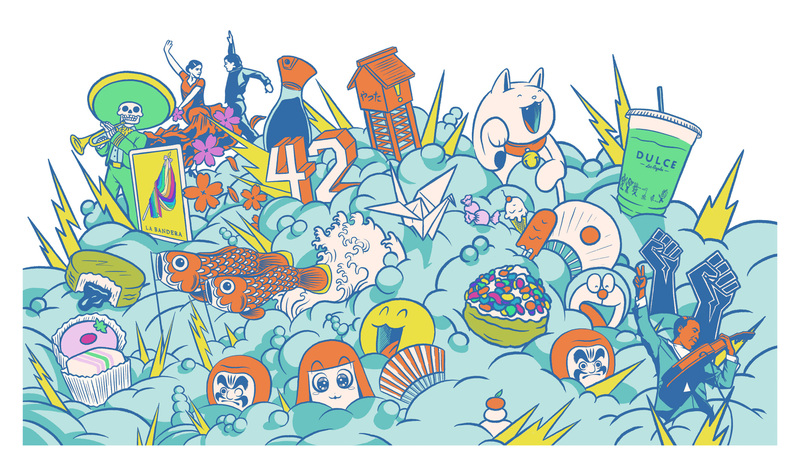 I chose to illustrate a dynamic explosion of icons to invoke the growth and energy that Little Tokyo continues to promote. The design is influenced by the diverse communities that make Los Angeles a unique cultural family which includes Latinxs, African Americans, and Japanese Americans, to name a few. Recognizable icons such as lotería card, raised fists, and daruma doll are representative of this community’s past and future. It is an honor to contribute my creativity to a community that I am very fond of. Los Angeles and Little Tokyo will forever be my home and my place of inspiration. Protect Little Tokyo: She is the primary pagan Goddess of the Shinto Religion. She is also the Sun Goddess and the Genesis Creation Goddess of Japan. Here she is depicted as samurai warrior/goddess with a specific “To Do List.” Task #1: Fight to protect Little Tokyo from hostile takeover with her solar-sparked katana sword and sun-rayed shuriken stars, as she effortlessly combats all evil singlehandedly. Save First Street North: At the Anime Jungle doors she flanks the two windows. Task #2: She is the fierce protectress of the First Street North business owners—done remotely from her home in the softly golden, shady part of the sun and her magical mirror. Selfie: And lastly, Task #3: As a typical tourist, she has a bit of down time to have an imagawayaki in the Japanese Village Plaza and have a ubiquitous selfie moment, before ascending to the next mission. Jaimee Itakagaki: I was born in Boyle Heights on 5th and Boyle Avenue, and my parents owned a supper club called “The Ginza.” Little Tokyo is where I had my origins. I have lived and worked in the Arts District as a commercial and fine art photographer for the past 21 years. Our building was purchased by a multibillion dollar corporation this year, and we, some of the last remaining artists in the so called “Arts District,” were evicted. Most of us were Japanese American. Now we must continue the fight to protect artists and Little Tokyo. A leather bound almanac holds unrecognized faces that feel strangely familiar. Against the backdrop of a desert landscape we see a cactus peering out from ground, or is it a cannon? In a narrow space, between people, we find our points of contention. The innocence of those we miss is translated through illumination. Where do we find our other? The domestic space produces many stages for our scripted roles. The home. Our home. We must return to a place where water touches land. Against the bank of the river, we watch and wait. The birth of flight catches our eye in the undisturbed silence. With a pilot we never lose site of the horizon line. The photograph tells us nothing. Let’s begin there. It is in our awakening in the night, a familiar sound, evocative of our childhood, that reminds us of the constant rising sun. Only in our forgetting can we begin to understand the present. Inspired by the Ensō symbol and the juxtaposition of Little Tokyo’s past and present, our piece celebrates the community’s 134 years of strength and resilience. The left panel illustrates a map of the community in the early 1940s, with First Street North sitting at the center of many Japanese American businesses. The block is highlighted with a red circle, an imperfectly-edged abstraction of the negative space inside of an Ensō symbol, as well as of the iconic Japanese flag. 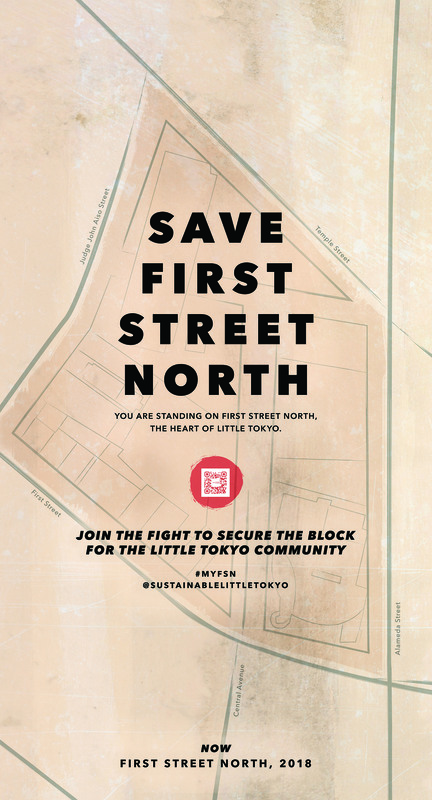 The right depicts the community today: many pre-War businesses are long gone, but First Street North unequivocally persists as the heart of Little Tokyo. “Our History. Our Future. 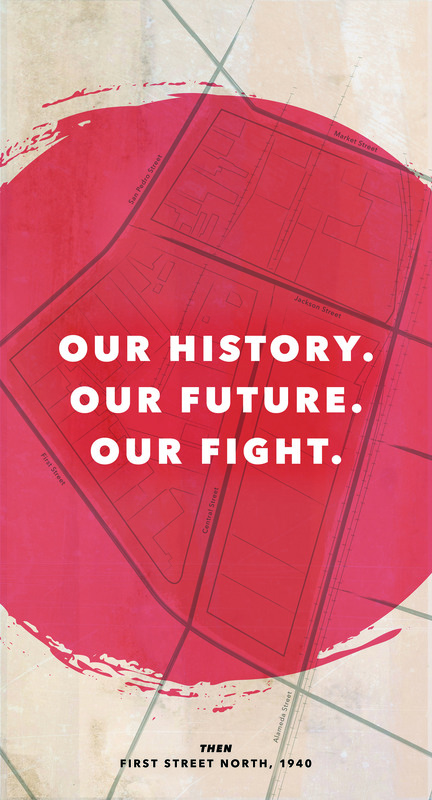 Our Fight.” invites viewers to join the movement to support Sustainable Little Tokyo’s vision for cultural, economic, and environmental sustainability. Scan the QR code to learn more! When I used to live in L.A. as a foreign student from Japan, I recognized Little Tokyo only as an area for dining and shopping. However, I learned more about the nuances of the community as I heard stories from the people I met at Little Tokyo Towers, a low-income residence for seniors; the recently evicted Japanese American artists living and working at 800 Traction Ave; and the regulars here at Far East Lounge, which provides classes for seniors. The residents of Little Tokyo show continuous curiosity for advancement and health, determination to preserve the Japanese and Japanese American culture, and resilience towards the city’s ongoing development. 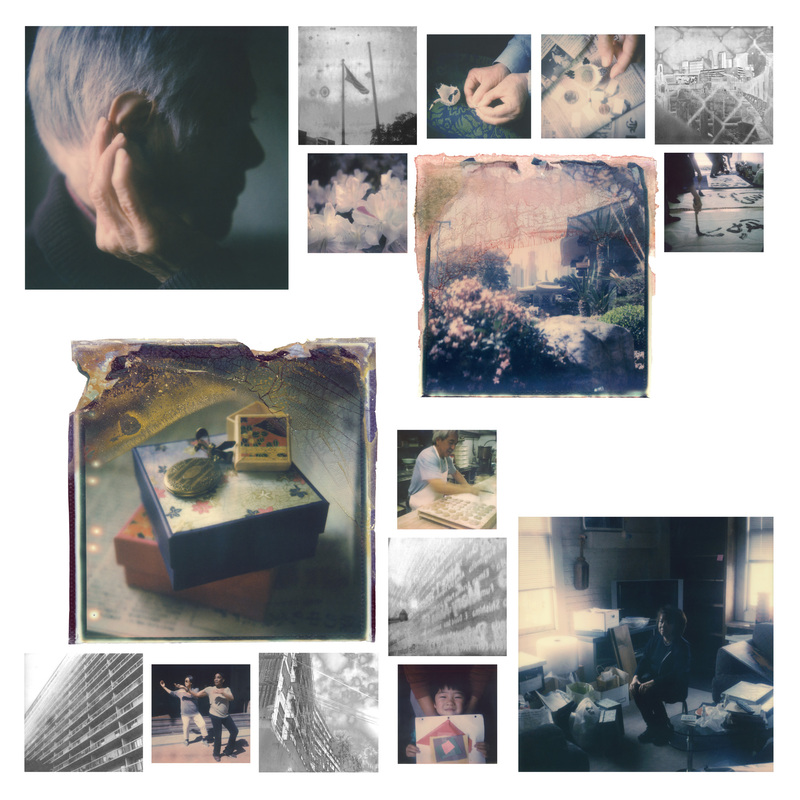 These polaroids taken here reflect the memories they have shared, challenges they face, and hopes they keep. 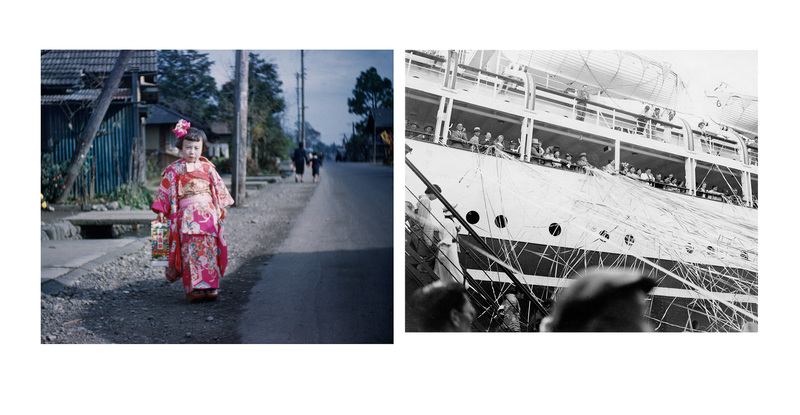 I would like for this collective image to evoke empathy in the passerby towards the more personal face of Little Tokyo. 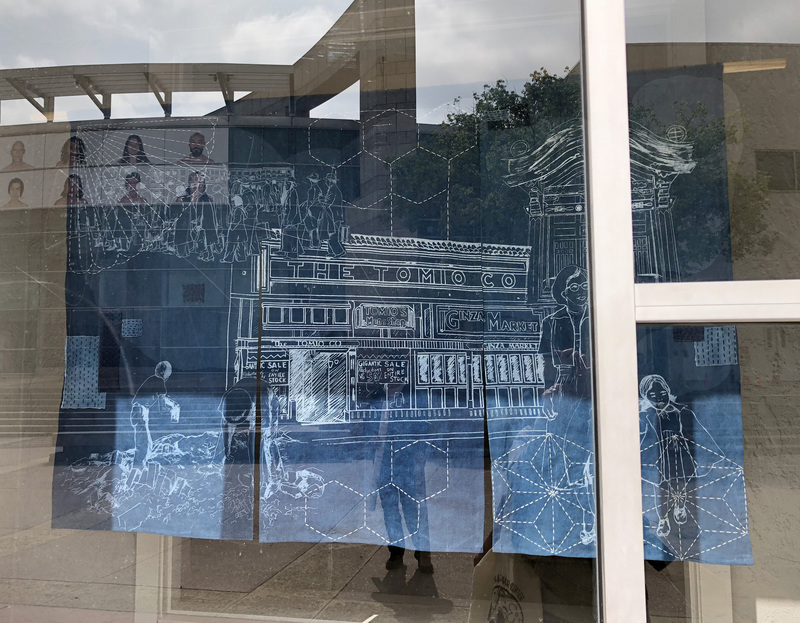 For Windows of Little Tokyo, I have utilized the structure of a Japanese noren (doorway hanging) to present imagery that represents events that occurred in the Little Tokyo community, and specifically, events that have impacted the future of the Little Tokyo. Images such as Japanese Americans being loaded on buses for American concentration camps during WWII and workers collecting bricks after the demolition of part of Little Tokyo are also meant to serve as reminders of the unjust treatment of immigrants and the consequences of gentrification that concern us today. The images are screenprinted on hand dyed indigo fabric, which has been treated to appear aged. I have also incorporated into this piece traditional sashiko stitching and boro patchwork. The use of boro is a reference to the mottainai mindset, or repurposing something by repairing it and creating something unique and beautiful—not being wasteful. Windows of Little Tokyo → Little Tokyo transforms into an outdoor art exhibition with 11 artworks displayed on windows across our historic neighborhood.